Facing the question which Ruby Rack server perform best behind Nginx front-end and failing to google out any exact comparison, I decided to do a quick test myself. Later I tried to test UWSGI server too as it now boasts built-in RACK module, but dropped it for two reasons: (1) it required tweaking OS to raise kern.ipc.somaxconn above 128 (which none other server needed) and later Nginx’s worker_connections above 1024 too and (2) it still lagged far behind at ~ 130 req/s, so after successful concurrency of 1000 requests, I got tired of waiting for the tests to complete and gave up seeking it’s break point. Still, UWSGI is very interesting project that I will keep my eye on, mostly because of it’s Emperor and Zerg modes and ease of deployment for dynamic mass-hosting Rack apps. As UWSGI was originally developed for Python, I wasted a bit of time trying to get it working with some simple Python framework for comparison, but probably lack of knowledge on my part was the failure of it. To set up a basic testcase, I wrote a simple Rack app that responds every request with the request IP address. I dediced to output IP because this involves some Ruby code in the app, but should be rather simple still. Tweaking the concurrency number N (see below) with resolution of 100, I found out the break point of each of the servers (when they started giving errors) and recorded the previous throughput (the one that didn’t give any errors). 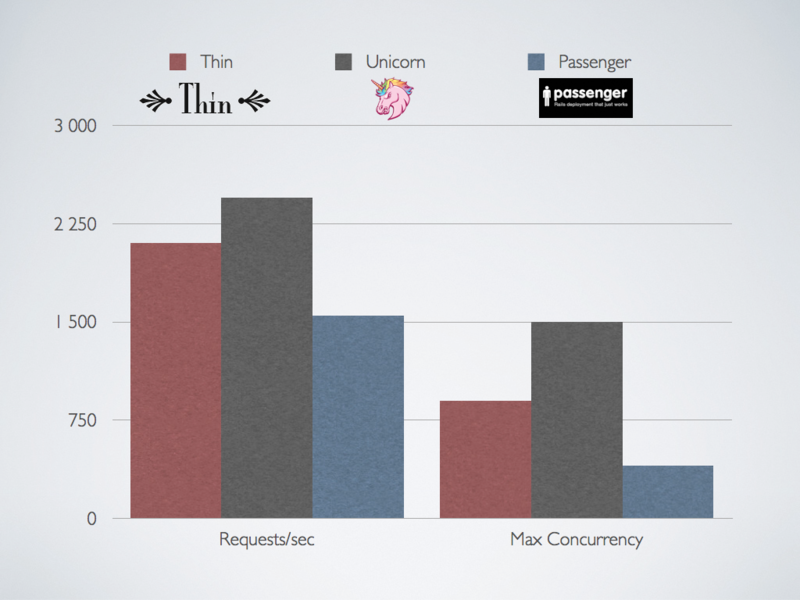 None of these throughputs are bad, but still Unicorn and Thin beat the crap out of Passenger. As is only logical, having processes match the number of cores (dual HT = 4 cores) gave best results for both Thin and Unicorn (thouch the variations were small). I admit that this is extremely basic test and with better configuration much can be squeezed out from all of these servers, but this simple test surved my purpose and hopefully is of help to others too. git log --graph --full-history --all --color --date=short --pretty=format:"%Cred%x09%h %Creset%ad%Cblue%d %Creset %s %C(bold)(%an)%Creset"
UPDATE: I added author name to the end of line in bold so that you can blame people quicker. This produces graph shown on the image. NB! Notice the two sets of quatation marks. Today I woke up with a new name for my blog. It is now known as CommitBlog. When starting something new, there is always the problem with the name. The worst part is that, most of the time, you need to come up with a name just in the middle of creation and when you least know, whether the beast will walk, swim or fly. And the name sticks. And sometimes the name stinks too. After some initial moments, I never really liked the name Brolog (being not-so-clever wordplay on Prolog and Blog). Given that I have never actually seen Prolog in action and know nothing of the language it seemed a bit false. So today I woke up and had a new name, that relates more to what I do daily – commit to GIT. Or write to commitlog if you will. So. There you have it. CommitBlog.